Sometimes it is necessary to reduce the diameter of the chimney liner during its course. This reducer is designed to work with the Heat-Fab Saf-T system and reduces the diameter of the pipe from 9 inches to 8 inches. It is made of 304-alloy stainless steel. The large crimped end is the male end. 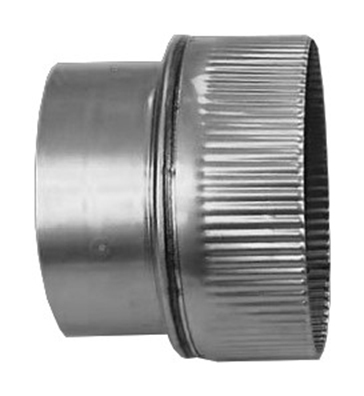 When calculating pipe length, this reducer adds approximately 1.5" to the total length. Like the rest of the system, this part should be wrapped with the Saf-T Wrap insulation to achieve the UL listed clearances. No as Class "A" pipe can not be reduced or increased. do you carry the reducer from 9 to 8 in black stove pipe ?